After a 41 day period of holding back in everything I was doing before my injury, race day was a little like coming to the end of Lent. My brother (Robert) and Lil Sis (Carol) arrived at Diablo Grande ready to take on the 4 mile (21 obstacle) course. It was a cool but sunny day and we were grateful that it was not the blistering cold we had experienced the morning of our volunteer shift. 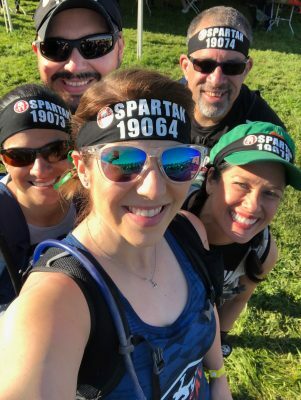 After checking in at the volunteer registration table, we found a sunny place to prepare for the race – securing our headbands, timing chips, and start wrist bands. We checked our bags, emptied our bladders, did a mini stretch and warm up and reconnected with Jen & George. When our start time was called, we made our way to the start, hopping the low wall into the coral. The plan was to walk, not jog or run, the entire course to preserve Robert’s knees…and my newly healed hip. So when the gun went off, I did a slow jog out of the way then reconnected with Robert and Carol after the crowd had passed. Soon after, we hit the Overwalls and Rolling Mud. After that, the trail turned to the right, avoiding the steep hill I experienced last year. It was a short walk before we arrived at the 6’ Wall. All three of us managed to get over on our own. The Herc Hoist was next, followed by the Multi-Rig (All Rings for the Sprint). Then came the Hurdles. After each trying to hop up to the pointy crest, Carol and I helped each other over the lot before we went on to the Atlas Carry. Remembering the technique of rolling the stone from the ground up one bent knee then across the other raised knee, I managed to lift mine off the ground without my back taking the brunt of it. It was a nice change for me. The three of us met up and walked to the Rope Climb. Much to my disappointment, my proficiency at pinching the rope with my feet had suffered with all of my training focus having been on the Monkey Bars and healing my hip. I got two-thirds of the way up the rope before my arms began shaking from doing all of the work. I opted not to push my luck and took my 1st thirty Penalty Burpees. I was joined by Robert and Carol. We walked a bit before hitting the Bucket Carry. This has never been a favorite, but I picked up my bucket with hope that it wouldn’t be as bad as the last time. The hill we carried our loads up and then down was steep. 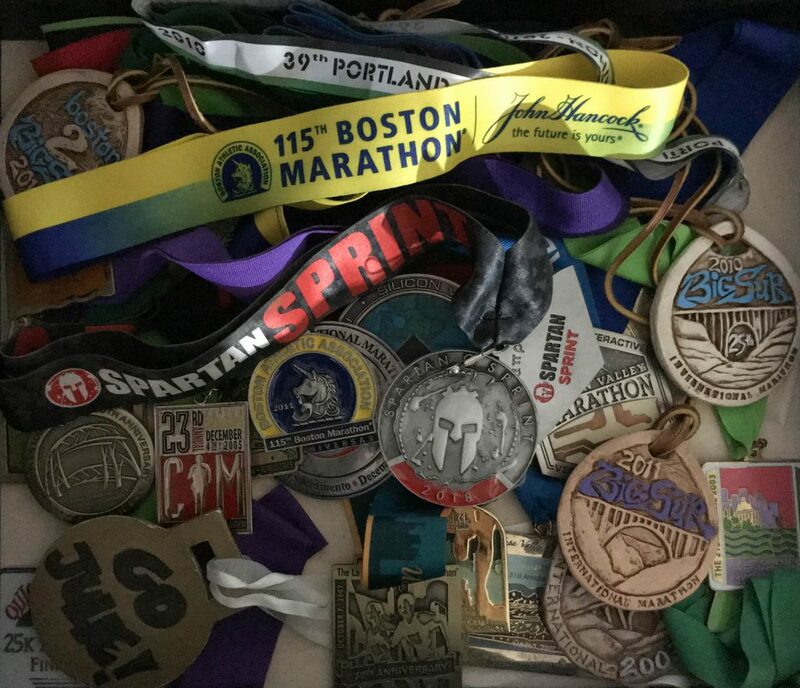 I focused on firming my core and pelvis as I made my way and I had to stop a number of times to give my back a break or let the crowd ahead thin out so that I could choose my path of preference. This was important as it was hard to see over my bucket on the way downhill. Robert and Carol waited for me to finish before we climbed the next hill. We arrived at the Spear Throw next. I set up my throw, aimed at the target, but somehow managed to hit my pack and head with the spear at the end of my throw. Thirty more Burpees for me…and Carol. But Robert hit it straight on. 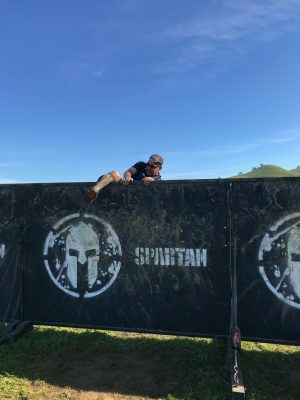 He went ahead of us towards the [uphill] Barbed Wire Crawl – which was lower to the ground than other races. Much to my surprise, I earned my final 30 Penalty Burpees on the Z Wall. This obstacle, although challenging, has generally be doable for me. However, it seemed that my new orthotics, in doing their job of keeping my foot arches supported, also kept my feet from moving to the front of my shoe. After making the critical turn, I slipped off as the front of the shoe gave way on the foothold. The Vertical Cargo, Plate Drag, and Sandbag Carry came next. 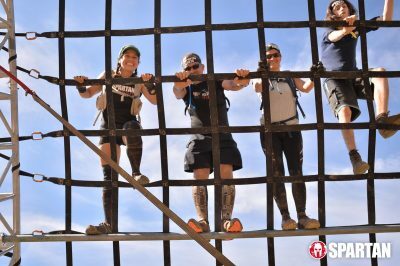 The three of us stayed together for a sibling photo opp at the end of the Sandbag Carry and again on the A-Frame Cargo net. When we arrived at the Monkey Bars, the moment of truth was finally upon me. Here I would find out if all of my training efforts were enough. After removing my water pack, I took a deep breath and began my journey across. The bars were big around making it harder to stay on top of the handhold; I had to readjust my grip a few times as I made my way across. The closer to success, the more determined I was not to let all of my efforts go without a fight. 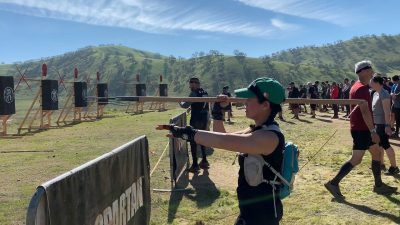 Once on the final bar, I paused as I tried to judge my final swing for the bell. My hand-eye coordination has never been a strong point. I hadn’t practiced this part of the obstacle and feared I would swing and miss. The bell was a bit further away than I would have liked. I had to swing harder than ever in order to reach it. Thankfully, I managed to hit it before swinging myself right off the bar. 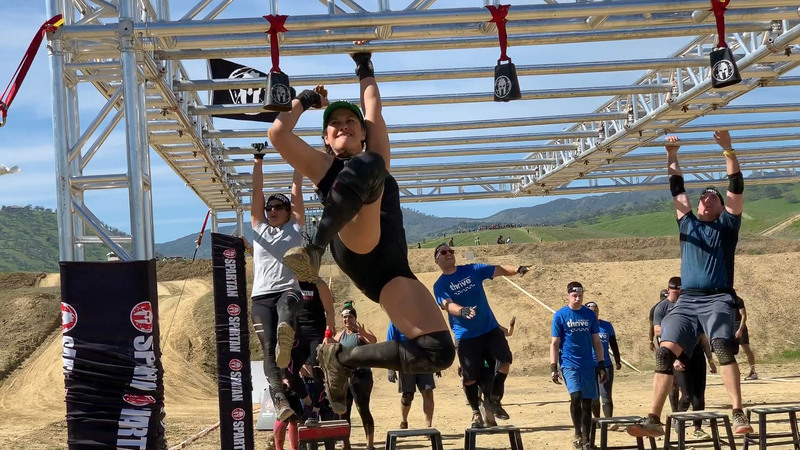 We finished off the race with the Dunk Wall, Slip Wall, and Inverted Wall – then crossed the finish together. 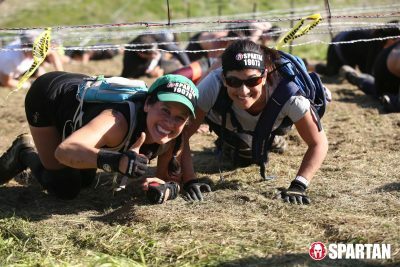 Next up: Spartan Super Monterey (actually Salinas) in June. This is my story. It’s rather LONG but I’m sticking to it. Don’t feel obligated to read all of it. If you follow me on IG, you know how the story ends already. 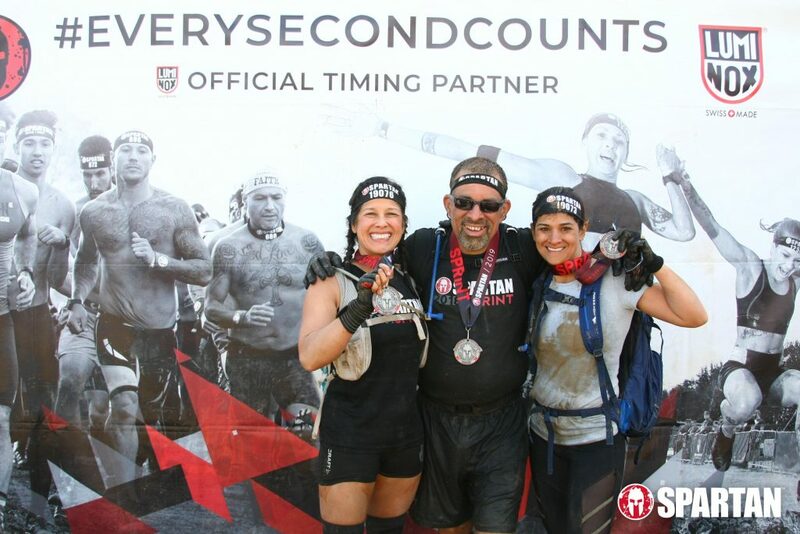 I crossed the finish line and earned my first Spartan Medal. The journey was unlike anything I’ve ever done. 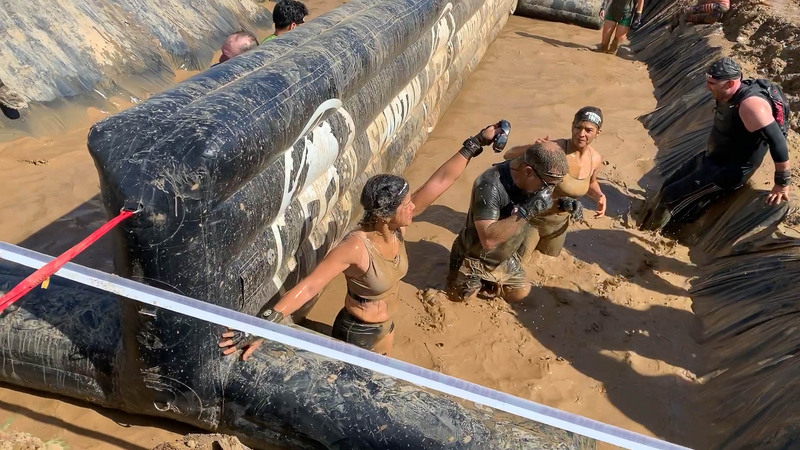 It was grueling but oddly fun at the same time.